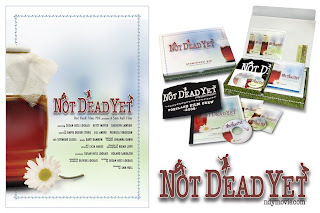 Oakley Design Worldwide recently designed and produced the promotional materials for the upcoming feature film Not Dead Yet. Materials created include: teaser and main theater posters, promotional pak, press release booklet, crew shirt, festival postcards, master logo, and much more. Not Dead Yet is the story of three actresses that have "hit the unemployable wall" and crave that one last acting job that will prove to themselves and their audience that they have what it takes to make it in an industry that caters to young actresses. It is also the common thread to all three actresses. The challenge was to take something so brownish & dirty in color, and make it beautiful to look at. We decided to use the jar shape and the color of the liquid to our advantage, and put it against a blue, green, and soft yellow blurred background. The final touch to the overall image was adding a simple backyard daisy to the mix - which also ties into the end of the film. Not Dead Yet is currently being shown at film festivals and will make its theater debut sometime in the fall of 2009.